Preheat oven to temperature directed on cake mix package. Line 24 cupcake molds with paper or silicone cupcake liners. Set aside until ready to use. 1. Make cupcakes according to directions, substituting milk for water and adding enough pink or blue paste food coloring to the batter to create a pastel colored batter. 2. Bake according to cake mix package instructions. Remove cupcakes from oven and cool on wire racks for 30 minutes before frosting and decorating. 3. Place the purchased frosting in a bowl and add Vanilla and bubblegum flavoring. Tint the frosting pink or blue as desired with the paste food coloring. 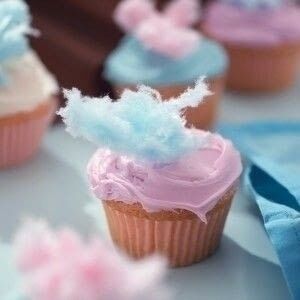 Frost cupcakes and decorate with a small amount of cotton candy in the center of each frosted cupcake. Bubblegum flavoring may be purchased at cake decorating supplies stores or craft stores. these look delicious! really pretty pic. I bet you have to eat those pretty quick, or the moistness of the frosting is going to melt the cotton candy. ohhh they looks so yummy , so sweet the picts. love the pretty look.